DR. ALEX HAMILTON, THEORETICAL PHYSICS, UNIVERSITY OF CAPE TOWN (SOUTH AFRICA): "A refreshing reminder to those of us who could be rocket scientists that there is more than one way to define well-educated." ALI SCORER, NEWTON COMMUNITY FARM: "The First Thirty is thought provoking and humbling and inspiring. There are so many reasons why you, your kids, your friends and your friends' kids should read this book." ALISHA, BJE IMPACT: CENTER FOR JEWISH SERVICE LEARNING: "...a powerful reminder that each individual has the power to drastically improve the world around them, often through seemingly small actions...uplifting, inspiring, wonderful..."
ALISON SAVETT, ELEMENTARY SCHOOL TEACHER, MARYLAND: "Greg’s storytelling of The Milkshake Man [the upcoming picture book edition of The First Thirty] was extremely inspiring to even our youngest students. It touched the core value of kindness that we are modeling & teaching our students each day. The students were engaged during the reading and excited to hear that the events in the story were in fact true.."
​ALLIE, HIGH SCHOOL STUDENT, NEW HAMPSHIRE: "The First Thirty is a wonderful book that reminds us of the magical things that can happen when spending time with our grandparents...I have started on the workbook (A Place To Sit) and on the first page I have already thought of so many ideas on how to help out the community while doing the things I love...Thank you so much for all the tips & ideas you have given me..."
AMBER W, CAMPAIGN DIRECTOR, TEAM IN TRAINING, THE LEUKEMIA & LYMPHOMA SOCIETY: "...very inspiring and appreciated the point that anyone, anywhere, at any age can make a difference. Too many times teenagers, or recent college graduates are told that they don't have enough experience to do the "real work" within a company so they're stuck in a corner filing papers. That sort of experience has the tendency to beat the creativity and passion out of some folks to do more. It's really unfortunate because they have so much to offer and an insight that hasn't been tainted by what's "possible" just yet based on what's been done in the past. I really try to stress to my staff that regardless of title, each person can come up with a really great idea that causes us to raise more money and make a greater difference toward finding a cure for cancer. If they don't truly believe that, and I don't truly believe that, it would be difficult for us to work really hard together, as a team with respect for one another. I'm definitely recommending that my staff read this book. It's full of great life lessons and work lessons, especially for those in the non-profit sector." AMY BILLEITER, PRINCIPAL, DANIELS ELEMENTARY SCHOOL (Texas): "Greg read The Milkshake Man with our students. The story reminds me of what my Mom says: 'The most important thing in life is try to do the very best for your neighbors. What a great experience for our students!" AMY D, WISCONSIN: "...[While reading The First Thirty], I am filled with such JOY and at times, I find tears falling from my eyes. They fall so easily. I LOVE THIS BOOK!!!!!!! I'm so blessed to have purchased it!!! Thank you!!!" AMY PSZCZOLKOWSKI, NOW AT PRINCETON UNIVERSITY, FORMERLY IN THE OFFICE OF THE PRESIDENT & FIRST YEAR EXPERIENCE PROFESSOR, ASNUNTUCK COMMUNITY COLLEGE: "A great story of redemption and determination...a virtual case study for First Year Experience programs...a blueprint for new college students." AMY Z, ELEMENTARY SCHOOL TEACHER, ILLINOIS: "Every educator in America should read this story. It reminds me why I became one in the first place." ANA OPRISAN, COUNCIL OF EUROPE: "The Silhouette Man traveled with me from Strasbourg, France to Istanbul, Turkey to Bucharest, Romania and back. I smiled, I laughed, I cried, I was surprised, I was worried, I was impressed and I was inspired. The book was a journey. What Greg shows is that we actually can be and do better, against all disappointments, against all odds, within the limitations of our power and resources. He is a sparkle of uniqueness, and I wish more people would follow his example -- helping others, never dismissing the value of differences, the value of doing things differently and altogether never dismissing a stranger." ANDREW KUBICEK, BOSTON COLLEGE: "As a student at a Jesuit University, I can say [the main character in The Silhouette Man] is a perfect example of being a man for others. The book accurately embodies all Greg is and has motivated me to further my volunteering in Nicaragua. Fantastic read for any aspiring young adult!" ANDREW S, STUDENT, BOSTON COLLEGE: "I wrote an essay about Greg for a course I am taking -- comparing his story and what he's done with Ralph Waldo Emerson's book Experience, and one of Gandhi's philosophies about small actions leading to big things." ANGELA C, PARENT, MONROE SCHOOL FAMILY READING NIGHT: "My family greatly enjoyed the reading of The Milkshake Man. During these divisive times, it was a great reminder of the importance of making positive connections and helping people of all walks of life. We all found it very inspiring!" ANGELA D, PARENT, MONROE SCHOOL FAMILY READING NIGHT: "The Milkshake Man can be enjoyed by all ages. I joined my 4th grade daughter at her school for a Reading...and truly enjoyed the message of the story and Greg’s interaction with the kids and adults. I look forward to sharing his other books with my children." ANNA MARIE JOHNSON TEAGUE, DAWSON + MURRAY + TEAGUE COMMUNICATIONS, TEXAS: "...a tribute to teachers - those found in classrooms, and those who impart their wisdom in the course of everyday life." ANNE EDWARDS, RAINTREE MONTESSORI SCHOOL: "The messages Greg conveys in his books - including The Milkshake Man -- are so important for all of us to hear---especially our kids." ART WORLD NEWS: "The First Thirty is a moving portrait of a man who treats life as art and created a masterpiece by helping others realize their dreams." BARI L, MIDDLE SCHOOL TEACHER (IL): "I am a Middle School special educator & I am using The First Thirty with my students in my reading class. I love the book & its life lessons. I am using the workbook with them, too (A Place To Sit). Wow! What a great way to teach these kids about life...I have been teaching special education for 19 years and I still love what I do...The book definitely makes you think about your life and I realized that I am happy with my life and what I do...I was at Borders and saw the book. I was a little curious, so I bought it. The best small investment I made. Thank you for putting Greg's life on paper and sharing. Thank you for touching my life and my students." BETH H, MIDDLE SCHOOL STUDENT, CANADA: "We read The First Thirty together in class. I thought the book was amazing. Inspiring, moving, motivational, and the list goes on...It's definitely a book I'll be recommending to anyone, young or old. I'm sure I'll be reading it over again and again until the pages wear out." BETH SCHAEFER, ASSISTANT LIBRARIAN, MONROE PUBLIC LIBRARY (IA): "The Milkshake Man is an important lesson for children that one small act of kindness can change lives, and a reminder to adults that it's never too late to start making a difference in your community..."
BLAKE STROUSE, ILLINOIS: "The Silhouette Man reminded me of The Secret Life of Walter Mitty. He had big dreams and jumped from one to the other." BOB MIDDLEMAS, EXECUTIVE VICE PRESIDENT, NORDSTROM: "...should be required reading in business school. It's a case study in how to start small, think big and lead by example." BRANDI LORD, BRANCH MANAGER, FIRST CENTRAL STATE BANK, IOWA: "I was fortunate enough to be present at a reading of The Milkshake Man [for kids at a summer camp]. The messages in the book are positive & inspiring messages that anyone from young to old can relate to." BRENDAN S, BOSTON COLLEGE STUDENT: "Greg's story ranks right up there with Rocky, Forrest Gump, and the other classic underdog stories of our time." BRITTANY, HIGH SCHOOL INTERN, REGIONAL OFFICE OF EDUCATION: "I think The First Thirty is a great book for anyone of any age." BRITTNEY, COLLEGE STUDENT, GEORGIA: "My routine has been class-work-class-events-study...but every night around 1 AM, I read [a few more] pages of what is] quite possibly one of, if not the best, books I've read in a few years. I LOVE the book [The First Thirty]! !...As I have read it, I really feel inspired...I really have enjoyed the thirty lessons. They are all so true! That has been my favorite part along with the "milkshake moment" and the importance of remembering names. After I read that part, I decided to take that with me and get better at names because they are really important!" CAROLYN SILVER, ESQ., DIRECTOR OF LEGAL ADVOCACY & ORGANIZING, LENOX HILL NEIGHBORHOOD HOUSE: "...I read the book [The First Thirty] yesterday. I don't even know where to begin. It was really amazing to read and I was really impressed and inspired with the story. I really related to Greg and his drive and his interest in helping people...and I think it will really inspire my staff - who are all like-minded folks, trying to do what they can to make a difference in our community, while battling many [obstacles]..."
CARRIE C, 2nd GRADE TEACHER, ILLINOIS: "The Milkshake Man has such a powerful message and at the perfect level for [young elementary school students] to understand...."
CARRIE H: " What an amazing story--like the movie Pay it Forward. I have made many of the same observations about how people typically isolate themselves by associating with others who look and/or think like them. It reminded me of when I was a grad student and I started a series of diversity dialogue lunches with various undergrad students in the business college. That was the foundation of the class I co-created and co-taught the next semester. But I didn't really follow it up with the drive that continually pushed you forward. I love the framing of the story--it definitely kept my attention. I have to say, after reading it I did a quick inventory of my own life and am feeling even more so discontent with it...I think actually that -- like happens in the book--sometimes I don't want to start with baby steps. I want to do it big or not at all, and in addition to me being my own worst enemy, this might be my biggest obstacle...some great lessons in the book. I think it's ironic that a lot of the lessons in the book were things Greg didn't buy into right away, and often failed at before coming full circle." CeCe McCALL, NATIONAL CONFERENCE FOR COMMUNITY AND JUSTICE OF METROPOLITAN ST. LOUIS: "I've really enjoyed reading The First Thirty. The simple lessons were powerful! I really am blessed by the relationship Greg shared with his Grandma. I fully understand his sincere love for her...the book was a great read and reminds me to face and answer the simple life lessons on a daily basis." CHICAGOLAND SENIOR NEWS: "Greg's Grandma plays the role only a grandparent can play - the reality check"
CHLOE LEE, OFFICE OF SERVICE-LEARNING, SIM UNIVERSITY (SINGAPORE): "This is a heartwarming and inspiring book with many little life lessons/ reminders for us. And I love his relationship with his really hip grandma." CHRIS, STUDENT, USC (CALIFORNIA): "I thoroughly enjoyed the book. I endlessly admire the ambition and persistence Greg demonstrated when dealing with his desires and dreams. The story is full of lessons that were particularly valuable to me...I [even] seemed to be able to apply the [lessons from the book] to my life as I was reading it. The advice often rang in my head as I confronted life's daily obstacles, and I truly believe I made better decisions because of the shared experiences. Greg overcame difficulties that I certainly could relate to as a college student, and he did so in such a way that has inspired me to start paying as much attention to my dreams as he does..."
CHRIS HERMAN, PITTSBURGH DILLER TEEN FELLOWS COORDINATOR: "[A Place To Sit is] a tremendously helpful resource for any program that encourages its participants to be empowered and inspired leaders with a sense of commitment to serve and a deeper understanding of their responsibility to the world." CINDY S, TEACHER, WASHINGTON SCHOOL, ILLINOIS: "The message of The Milkshake Man was inspiring. The students [2nd graders] loved the book. It emphasized that everyone is important. Everyone can make a difference. The smallest act of kindness can go along way." COLBY, FORMER STUDENT-ATHLETE, HOPE COLLEGE & NOW A TEACHER: "... [taught me] how small moments of kindness can positively affect people [in our community and far beyond it]... his words have pushed me to understand the greater man does the right thing even when everyone else is not looking, which is why I have succeeded thus far in my life." COLLEGE NEWS: "A remarkable story of strength filled with lessons that will take every student through the college years and beyond." CYNTHIA K, MIDDLE SCHOOL TEACHER, ILLINOIS: "The kids are enjoying [the] book immensely...We're currently working through the book, stopping to discuss each life lesson in detail. Today we had a breakthrough on prejudice and prejudging others, using [the part of the book about] the female customer who moved her purse in view of the African American teenagers. The bell rang and not one student wanted to leave the class...Thank you for your inspiring story." DANIEL MOLINA, CAMP COUNSELOR, TESOMAS SCOUT CAMP: "If there was ever a guide book for how an educator or camp counselor should think about the world and teach, it would definitely be The First Thirty." DAVE SANTULLI, EXECUTIVE DIRECTOR & FOUNDER OF UNITED PLANET: "A kindred spirit who is trying to unite the world in his own unique way...His path is filled with perseverance, vision, daring adventure and a zest for life... If you want to change the world or fulfill a dream -- big or small -- read The First Thirty and begin your journey!" DAVID C, CALIFORNIA: "...I am just starting a career, and am at a critical point in choosing where I will take it. I ​have always looked at my career in terms of finding the right balance of [how much I enjoy myself and how much money I make]. Reading The First Thirty has modified my view of success to include the interaction I have with the people around me." DAVID D, MEDICAL STUDENT, ILLINOIS: "I interact with people going through adversity every day. I use lessons and take inspiration from The First Thirty to help me create unique solutions to many of the problems." DAVID J, COLLEGE STUDENT FROM TEXAS: "...The Silhouette Man has been a great read and I would definitely recommend it to other students. It reminds me to be kind, curious and to never give up on an educational, civic or business dream in the face of rejection... When we are able to stick to the optimism of our childhood and follow our innate passions, then we are unstoppable. It seems to me that Greg personifies this idea... His desire to experience new things -- his curiosity -- evolved into a willingness to learn about the story behind every face he encounters..."
DAVID M, ART PROFESSOR & PARENT, MONROE SCHOOL FAMILY READING NIGHT: "My family and I enjoyed the reading of The Milkshake Man immensely. It is an amazing and endearing story!" DAVITA S, PARENT, ILLINOIS: "I loved The First Thirty! !...more than anything else, what is so extraordinary...is that it documented Greg's entire life in less than 100 pages, and, (2) Greg LIVES his life so fully -- learning and loving along the way. That is in two short sentences what amazes me the most....actually to the point of tears!!" DEB TAYLOR, DILLER TEEN FELLOWS PROGRAM SUPERVISOR: "I think Greg's messages are universally relevant, from teens to adults, and remind us to live intentionally while valuing relationships, put our best selves forward and frame our days with acts of loving kindness, treat obstacles as challenges to overcome, and set goals and work toward achieving them. Good stuff!" DEBBIE FAILLACE, RESURRECTION SCHOOL, OHIO: "The First Thirty was a beautiful read and made me think about my life and the lives of others that may face many of life's challenges. People like Greg really make a difference in this world. I thank him for inspiring me..."
DEBORAH BLAD, SITE MANAGER, DAN NAGLE WALNUT GROVE PIONEER VILLAGE, IOWA: “We had a great time with Greg....during [our] day camp...We serve children from 6-12 and all age groups were engaged in his story. I think it surprised and touched the kids that [the main character in the story] was able to make a difference in so many lives...[After the Reading], we all had fun slurping our milkshakes in the Village's Soda Fountain!" DENICE PELLECCHIA, ADMINISTRATIVE COORDINATOR, MONTESSORI ACADEMY OF CINCINNATI: "Everyone - students & teachers - thoroughly enjoyed [today]...The Milkshake Man is wonderful. The message is so meaningful & inspiring. He captivated the children with every page he read. The [Q&A with the kids that] he led after the reading helped the students reflect on the content of the book [&] the important people & events in their lives, and how today may affect tomorrow. They and the staff left him feeling inspired! Thank you!" DIMITRI GARCIA, PRINCIPAL, PERRYTON JUNIOR HIGH SCHOOL, TEXAS: "I kept coming back to the notion of equitable exposure to life experiences....[The First Thirty] shows that a simple meal can expand students' horizons and provide them opportunity." ELAINE G, ILLINOIS: "The Silhouette Man is a tribute to grandmothers if there ever was one." ELENA, HIGH SCHOOL STUDENT, WISCONSIN: "As a young person reading The First Thirty, I found it to be very influential. Each lesson that is depicted in the book holds true value that I have learned from. I have recommended the book to many fellow classmates." EMILY P, 2nd GRADE TEACHER, ILLINOIS: "The Milkshake Man was an appropriate version for young students and kept their attention for the entire reading....The students were really excited and were able to transfer the message to things in their own life. I think it was great that it focused on yummy food which is something that they can definitely relate to, and it all began with just one simple step..."
ERICA V, PARENT, MONROE SCHOOL FAMILY READING NIGHT: "The Milkshake Man is truly an inspiring story and a wonderful reminder of how small, simple acts of kindness and generosity can go a long way and can extend throughout multiple generations. Great job, absolutely loved the story and the message!" ERIN, COLLEGE STUDENT, ILLINOIS: "The First Thirty tells a riveting, relatable story with invaluable life lessons, and it brings readers into its lesson plans. Just when you think you know what's coming, another surprise jumps out from the next paragraph to prove that nothing is impossible -- except, perhaps, putting down the book once you start reading." FAGAN HARRIS, CEO, BALTIMORE CORPS: "The Silhouette Man is a story about what young professionals can build when they harness their energy and passion for improving the world outside their window." FARIDA MATIAS, TEACHER, WASHINGTON SCHOOL, ILLINOIS: "We loved The Milkshake Man.... I liked that it talks about something they can all make a connection to -- milkshakes. The story [taught] something we try to ingrain in our students -- to be kind and help each other in our community of learning...[Since our class is a bilingual class], I also thank Greg for using Spanish [along with English] when he did the Reading. He helped encourage our Spanish learners. At the same time, he gave pride to the language for our Spanish speakers." FRESNO FAMOUS: "For anyone who's been knocked down or told, "you can't do it," The First Thirty is an uplifting read that will make you want to get up, dust yourself off, have a milkshake, and get back to work..."
GLOBAL HEROES MAGAZINE: "A story that personifies the word determination." to order copies of the books or workbooks, click hereThe Milkshake Man is truly an inspiring story and a wonderful reminder of how small, simple acts of kindness and generosity can go a long way and can extend throughout multiple generations. Great job, absolutely loved the story and the message! GREG PESCHEL, CHIEF EXECUTIVE OFFICER, KERR COUNTY YMCA: "The Milkshake Man is a great reminder that we need only to look outside our window to find a world ready for kindness." HANNES - THUNDER BAY, ONTARIO, CANADA: "At the recommendation of a good friend, I purchased The First Thirty. Fortunately, I finally found the time to read it and finished it a few weeks ago. All I can say is WOW!!!! Greg is truly an inspiration. Lead on!" JACKIE F, BISHOP GALLAGHER SCHOOL (CANADA): "...[The] message of making a difference in the world outside your window was extremely well received and links into so many of our stewardship and volunteerism lessons and activities within our school...."
JANE H, IOWA: "The Milkshake Man's message is strong and positive, supporting values of inclusivity, hard work, generosity and perseverance. We watched the main character access the wisdom of trusted loved ones, use creative tools to build community and opportunity, and work actively to make the world a better place. The clarity of the illustrations support the text beautifully. These messages and images communicate timeless values we can all continue to aspire to. The age range in the room today stretched from a 1st and 5th grader -to - people in the upper 90’s. I feel like we all took something away from the process of hearing your book. Thanks to Greg for making the time to share his story with us, and for such an interesting conversation [with the audience after the Reading]. as you make final decisions about this project." JANET GILLESPIE, HEAD OF SCHOOL, THE JANUS SCHOOL: "A Place To Sit supplies educators and school administrators with wonderful ideas to use with students of all ages and learning styles." JEANNE-MARIE, COLLEGE STUDENT, LOUISIANA: "An inspiring reminder that, whether it's the other side of the world, the other side of the country, or just the other side of the tracks, if you end up in a place you never expected to be and dare to explore it, you just may find your passion in the process." JEN BARTON, DIRECTOR, GENOA PUBLIC LIBRARY: "I thought that the reading [of The Milkshake Man] went well and was certainly appropriate for the age group that we had represented that day... Children who are of different sizes [and people of different races and backgrounds are] included in the artwork... It is important for children to see themselves represented in a book...I look forward to hearing when the book will be published so that we can add it to our collection here at the library." JENNA, CALIFORNIA: "The Silhouette Man was fantastic! It has everything you would want in a book: humor, interest, inspiration and encouragement, sadness and even some scary bits...That dreams and movies are interchangeable in the book...makes sense in American society. I like how this, to me represents allowing oneself to take away the best of society and give people the benefit of the doubt where appropriate. Belief in Hollywood I found especially encouraging toward not giving up on ones dreams and keeping the inspiration of cinematic art alive. Courage was displayed at The Club and that type of boldness is a great example for anyone trying to do anything with their life...I totally get what it is like to have your heart set on one thing and then have promised your parents you would do something different and having to try at that so not to break their hearts...I could not put the book down which is why I have so much to say about it. ..I read it and I was thinking, "okay. This is really good. This is pretty amazing actually, and this part too, and this part and WOW!" In a matter of a few lines. So I had to share some of that enthusiasm and zeal...I am recommending the book to everyone I possibly can..."
JENNI, KNOX COLLEGE: "...I was almost in tears during the last several pages. It was definitely inspiring and touching. It reminded me a lot of [a real-life version of the movie] Big Fish...I got goosebumps while reading this...I think I have some people to send this book to...The story is spectacular and I think a movie of it would be moving as well..."
JENNIFER C, NORTH CENTRAL COLLEGE: "Greg Forbes Siegman’s life story is an anthem for underdogs everywhere. Looking at Greg now, a naïve outsider would see a man who is successful, who helps young adults who are often overlooked by others. An outsider would also see a respected man who has inspired thousands of people across the country. What an outsider would not see is the painful rejection Greg has faced. They also would not see the doubtful faces ...who thought he was foolish. Jillip Naysinthe Paxson brings the reader through Greg’s long, first thirty in a way that makes one empathize with Greg’s pains and disappointments, which, in turn, makes one appreciate his successes even more....written in a skillfully detailed manner... It is a rare gift when a non-fiction writer can elicit raw emotions from his or her reader. Greg’s inspirational story combined with this gift that Jillip clearly possesses, creates a new way for the young reader to reflect on their first thirty." JERRY E, EXECUTIVE DIRECTOR, ST. LOUIS SOCIETY FOR THE PHYSICALLY DISABLED: "The First Thirty WILL inspire you to believe dreams ARE reachable, "I can't" turns into "I can", and that one person CAN overcome and make a difference (It will also give you a new appreciation for milkshakes)." JESS C, UNIVERSITY OF CONNECTICUT: "I will be graduating in December, then going on that following spring to get my masters in special education. I LOVED the book..I love Greg's Grandma. I was so inspired by the main character's stories and goals, even as a little guy! I have a warm spot in my heart for anyone who embraces and values their childhood. The main character is clearly such an amazing person who never stops giving. His example is certainly a powerful one that obviously leaves a lasting impression with many young people." JESSIE DeYOUNG, 2ND GRADE TEACHER, TEXAS: "The Milkshake Man has a great moral that teaches character and kindness. My second graders along with children of all ages can easily relate to the characters and learn key lessons that they can carry for life!" JIM K, PRINCIPAL, ELEMENTARY SCHOOL, ILLINOIS: "...an incredibly humble story....I am inspired by reading The First Thirty.. It was a quick and thoughtful read that left me thinking of ways I can reach out and make this community an even better place to be!" JIM KALLIERIS, PRINCIPAL, WASHINGTON ELEMENTARY SCHOOL, ILLINOIS: "In my opinion, The Milkshake Man does a great job bringing Greg's story down to an understandable and engaging level for the younger student audience....The messages of hard work, multiculturalism and effort came through in an understandable and fun way. The language of the story worked very well with our school's [emphasis] on Effort and Pride." JULIA, HIGH SCHOOL STUDENT, ILLINOIS: "The First Thirty is truly the story of an "everyday underdog." First, underdog: the obstacles that Greg overcame, initially seeming insurmountable, leave the reader cheering for a strong finish. However, Greg's story is not one of a perfected superhero. We can all see ourselves in some of the "everyday" lessons he learned as he became an adult. With the concepts of morality and perseverance interwoven into the storyline, it's no wonder so many use his story to shape the minds of students today." JULIE FRUHAUF, MID-KANSAS JEWISH FEDERATION: "A fabulous story. I was very inspired while reading it! I was so moved by the book that I have passed on our two copies to others to read, and I will continue to do so as they return to us, again and again! Good read. I highly recommend it!" JULIETTE BRADLEY, PRODUCT OWNER, INFUTOR DATA SOLUTIONS: "The Milkshake Man offers a glimpse into how small acts of kindness can lead to extraordinary change in perception of others, service to those in need, and gratitude for meaningful interactions. As a Mom to two young daughters, our family enjoyed [attending this] Reading together... All ages will benefit and enjoy this story and its timeless message." KARA S, FLORIDA ATLANTIC UNIVERSITY: "I just finished reading...I have to admit that it left me speechless...it is not like any biography I have ever read. It reminded me just how sacred everything is, whether it be a person, an idea, or even nothing, as Greg showed even nothing is something..."
KARA T, EDUCATOR, ILLINOIS: "I literally forgot to go to class because I was so wrapped up in the book...I have to say, I assumed it would be thought-provoking prior to reading it, but I didn't realize that it would be a forget-about-work, hole-up-with-a-book-all-night kind of provoking!" KATIE, KENDALL COLLEGE: "I was only halfway through the book before I couldn't resist pulling over on the way home from work and getting a milkshake...The First thirty is inspirational proof of one person's ability to build something meaningful out of literally nothing." KEISHA B, LOUISIANA NATIVE: "I finished the book. I cried at the end. It was beautiful." KELLI S, WISCONSIN: "Loved The Silhouette Man. Very inspirational. And as a woman whose Grandmother was one of her best friends and recently passed away, it touched close to home." KIMBERLY B, AMERICORPS GRASP: "I enjoyed reading The First Thirty so much that I plan to check out [the expanded version] The Silhouette Man. The three things I appreciate most about The First Thirty are Paxson's open writing style throughout the book, the variety of theme strands woven together from start to finish, and the impressive perseverance of Greg Forbes Siegman. Paxson's inclusive writing style is direct, candid and neutral. I believe Paxson has a good sense of humor because he has captured unbelievably funny, personal moments...Paxson's writing style brings the reader along for a ride...I felt like an honored guest spectator while I read The First Thirty because much of the book is very personal. There are many, many strands woven throughout the narrative. Themes such as the value of education, volunteering in communities, fundraising for nonprofit organizations, encouragement of diversity, goal setting, goal attainment, rules for life, the importance of extended family members like grandmothers and godparents, the value of humility, the power of a group as opposed to the power of one person. Greg's ideas about windows and the perspective available from the view of the windows in our own lives are very insightful and inspirational. His undying, deep-rooted perseverance is phenomenal." KLAUDIA Z, PARENT, MONROE SCHOOL FAMILY READING NIGHT: "My son said he really liked that [The Milkshake Man] was about helping people to be more successful...The story kept his attention, and he would not change any [illustrations], even if he could. He loved it. His dad also liked the reading. He liked that the story was very visual and specific, which helped kids to follow easily. He liked the positive messages in the story like helping others, valuing education, not giving up and more...."
KRIS E, PRINCETON UNIVERSITY STUDENT: "It makes you think about what it really means to be a success." KRISTINE SLOAN, ACTING CEO, StartingBloc: "The Silhouette Man is a story of resilience, adaptability, commitment and hope. It is a model for young professionals that shows how complex our road can be -- and how it is still possible to walk it." KRISTY MOORE, M Ed - NEA DIRECTOR FOR NORTH CAROLINA ASSOCIATION OF EDUCATORS: "The First Thirty is social justice at its best, as one person shows the world how a simple act can change lives. We as teachers can learn from this...as we continue to learn, grow and change lives daily." KYLIE, STUDENT, CENTRAL COLLEGE: "The book was a challenge to the way I think. It demanded that I think about rejection as something to embrace, and a positive experience - as opposed to something to be anxious about... It's a lesson I am applying in my life now- just ask, the worst that can happen is the person says no." LAURA A, GRADUATE STUDENT, INTERNATIONAL ARTS MANAGEMENT, CANADA: "The Silhouette Man is a heartwarming story about a remarkable man, his very wise grandmother and the power of the arts to transform the world, one person and community at a time." LAURA B, GENESIS MITZVAH FUND PROGRAM COORDINATOR, JEWISH COMMUNITY FOUNDATION (MINNESOTA): "...I finished reading The First Thirty on a trip...a very welcome companion during a 4 hour layover...I continue to be in awe...an amazingly talented author...I read the ending page over and over again, because I enjoyed it so much...The entire book was such an enjoyable read...I will be distributing the book to about 30 teen tutors in the Shabbat School program at my synagogue as a staff appreciation gift. I also intend to use it, along with the workbook (A Place To Sit) based on the book , as a teaching tool for teen philanthropy recruitment." LAURA O, CAMP GOOD DAYS & SPECIAL TIMES, INC: "The First Thirty is small in size, yet full of inspiration and lessons for all people - from all demographic, geographic and economic situations. A true demonstration in facing and overcoming adversity; where if you can dream it and believe it, you can achieve it." LEAH J, UNIVERSITY OF MISSOURI - ST. LOUIS: "It's essential that college students make the connection between what they are doing now and what they want to achieve after they leave here. The First Thirty could not only help our students see that connection but also give them practical tools that they can start using right away." LILLIAN HELLMAN, HEAD OF SCHOOL, MIZEL JEWISH COMMUNITY DAY SCHOOL (TULSA, OK): "Our Kindergarten through fourth graders all sat in rapt attention as Greg read the pages, projected on a screen, of the wonderful new book (The Milkshake Man) he is working on... The stock response of shock and amazement was wonderful to witness when the truth was revealed that he was actually "The Milkshake Man." 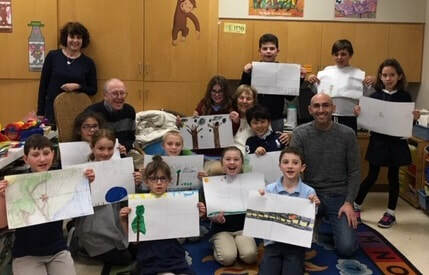 During the art activity after the reading, the students created wonderful, creative and thoughtful pictures of how they can make an impact in the world, even as a kid. It was great having him at our school." LINDA S, CANADA: "...I laughed, I cried but mostly I was inspired by what one person can achieve with determination. Great book." LINDSAY G, STUDENT TEACHER (& FUTURE FULL-TIME EDUCATOR): "I loved The First Thirty. It has a wonderful structure to it, especially how it maps out the 'hero's journey.' I think this would be a great supplement to the Odyssey, Catcher in the Rye, or even Beowulf. Certainly, when I establish my own class curriculum, I intend to implement the First Thirty in some way." LINDSAY W., ILLINOIS: "Fascinating story about an individual unlike any other in this world. This world would be a much better place with more Greg's in it. Very entertaining story." LINDSAY W, NONPROFIT MANAGEMENT & LEADERSHIP PROGRAM, UNIVERSITY OF MISSOURI - ST. LOUIS: "Any man, woman, child with an idea or dream HAS to read this book. Not only will it give them hope, it will inspire them to do more than they could have ever imagined. Throughout my life, I have spent countless hours volunteering in the nonprofit sector. Not only did the book resonate with my experiences, it has encouraged me to do more and accomplish more." LINDSAY M, KENTUCKY: "I almost finished the book last night but I wanted to wait until this afternoon so I could read the ending under the sun at the beach. I don't know how it came about with such great timing, but it did come along at a time when I think I understand it and could use it the most. It was amazing, Greg is amazing, inspiring, a million other words that still can't do it justice..."
LLEANNA McREYNOLDS, DIRECTOR, RAINTREE MONTESSORI SCHOOL: "The book was so uplifting and inspiring. I love Greg's fearless approach to creating an inclusive and diverse community wherever he goes. His Grandma taught him well." LUCY R, CBS 47, COMMUNITY SERVICES DIRECTOR: "The message -- to get out of your chair and make a difference -- is infectious." MARCIA O, PARENT, ILLINOIS: "Where was this book when I was in college and needed this kind of advice?" MARINA, EDUCATION MAJOR, CENTRAL COLLEGE (IOWA): "The First Thirty made me evaluate the way I live my life. Greg's lessons have broadened my perspective of the world outside my window and how I can impact it. It's an incredibly inspiring story of true perseverance and raw kindness. The lessons from the book will stick with me forever and are all things I hope to teach my future students...."
MARTI HIGGINS, EXECUTIVE DIRECTOR, INDIANA COUNTY CHILD DAY CARE PROGRAM, INC. (IndiKids): "I read the The First Thirty, loved it and ordered the expanded version (The Silhouette Man). Loved it, too. It was interesting to read [the expanded one] after the first - the added details made more of an impact because I already had the framework from the first....What an amazing journey Greg is on! I want to share his story with more people locally - and I am really interested to see the [upcoming picture book edition of the story]." MARVIN BARTLETT, FOX 56 KENTUCKY: "Greg has turned overcoming obstacles and rejection into art form." MARY B, COLLEGE STUDENT, OREGON: "A Place To Sit helps me learn from the past, achieve things in the present and set goals for the future." MARY VITULLI, PRINCIPAL, SAINT JAMES SCHOOL: "The First Thirty is an inspirational story...[it] has been a valuable tool in [the 5th, 6th, 7th and 8th graders'] religion classes to teach our young adolescents the importance of service and how helping others brings a sense of pride and achievement In oneself. Becoming an active citizen and a person of faith is what we strive for in each graduate...Service to others is a tenant of our faith. This is something we try to instill in all our children, that to give is greater than to receive. Reading Mr. Siegman's book and hearing him speak to the children has given our students much food for thought...[The story is] a reminder that it only takes one small action to begin to change the world!" MATT WINGER, VOLUNTEER SUPERVISOR, EVANSTON ANIMAL SHELTER: "With its twists and turns and ups and downs, The Silhouette Man is a true demonstration of the idea that perseverance and determination to make the world a little bit better can make a big impact with big smiles, big dreams and a milkshake." ​MEAGHAM F, TEACHER: "...I have been using The First Thirty as a reading text with my 4th grade class. The kids are highly engaged in the story. The vignettes and lessons provide so many jumping off points for thoughtful, critical discussion. I bought each of my kids a copy of the book so that they could make it their own by writing notes in the margins and underlining sentences and phrases that really stood out to them. They have also populated their books with sticky notes filled with questions, connections, evaluations, and analysis... I think this book is a wonderful teaching tool because it addresses so many of the kinds of issues kids face – like teasing, bullying, respect, self-esteem, imagination, friendships, loss, facing challenging situations, overcoming setbacks and obstacles, race/ethnicity and a variety of other important life issues. As I mentioned, my kids love it! The book also provides many opportunities for writing extensions and could easily provide a starting point for social studies related discussions or art projects. The reading level is accessible to my kids, especially with my support, and would be great for kids at the 5th or 6th grade reading levels [and up]..."
MELISSA G, 2nd GRADE TEACHER, ILLINOIS: "My students were captivated by such an inspiring and wonderful story. They expressed that The Milkshake Man showed how effort and perseverance should be an important part of everyone's life. They are eager to purchase the book once it's finalized." MICHAEL I, ACTOR/WRITER/DIRECTOR, CALIFORNIA: "...such an inspirational book that it can even give new hope to someone that's been living in Hollywood for the past fifteen years. It gives new meaning to the phrase "when life gives you lemons make lemonade" and it certainly has taught this old dog some new tricks. I may never look at adverse situations in the same way ever again. MIDWEST BOOK REVIEW: "A lesson in humanity...The First Thirty delivers a strong, positive message that is particularly relevant to high school students but is valuable to everyone...an uplifting true story that reminds us that all the movie-caliber underdog stories we see don't always have to be make-believe..."
MIGUEL P, COUNSELOR, JCC APACHI NORTHSIDE DAY CAMP: "I finished reading The First Thirty today. I read it everyday on my way to and from work.... It was something I really needed to hear in my life right now. I wanted to make a difference while still making a good living -- and I still do -- but I thought I would have to choose between the two or give one more attention than the other. But I know, [as a result of the Alex character] from this story, that with the right mindset and attitude I can accomplish both." MIKE LYNN, CEO, CRIPPLE CREEK BREWING CO: "Greg is one of the most interesting, creative characters I've ever come across in any book I've ever read. As for the story as a whole, there were parts that brought me to tears -- and I don't cry." MIKE M, UNIVERSITY OF SOUTH FLORIDA: "A Place To Sit ought to be in the backpack of every student -- and the briefcase of every adult -- in America. I know it's going in mine." MINDY HUBERTY, YOUTH WORKER, OUR HOUSE (ARKANSAS): "The First Thirty is an uplifting story for middle school kids and the mentors, teachers, and grandparents who believe in them." MONA VAN ZOMEREN, ACTIVITIES DIRECTOR, HOMESTEAD OF OSKALOOSA (IOWA): "As a [grandmother] of four, I would buy The Milkshake Man in a heartbeat! It was captivating and fun, full of life lessons and highly encouraging -- which is what I want to fill my grandkids' lives with! Knowing it is based on a true story only adds to the teachability of everything it contains..."
MONICA WARD, PRINCIPAL, FREDERICKSBURG ELEMENTARY SCHOOL (TEXAS): "My students, teachers & I had the privilege of listening to Greg Forbes Siegman read The Milkshake Man today. The story line was perfect for a group of 2nd graders as evidenced by watching the expression on their faces and the occasional outburst of laughter. The relationship between the two main characters led me to a happy place in my heart as I related to the characters' connection. A child's story worthy of accolades." MORGAN, HIGH SCHOOL STUDENT (TEXAS): "A refreshing reminder that each of us can -- and should -- be open to the world beyond our window while changing the world within it." MORGAN BLOM, ASSISTANT DIRECTOR OF ACTIVITIES, HOMESTEAD OF OSKALOOSA (IOWA): "At a sneak peek reading of The Milkshake Man at Homestead of Oskaloosa, Greg engaged an audience of all ages. His book is a great reminder of the many opportunities we have to make a positive impact on the lives of others. It encourages readers that we are never too young or too old to be learning and growing and making a difference in our community." MS. FREYTAG, TEACHER, ILLINOIS: "I read The First Thirty. Amazing. Difficult. Inspiring. Amazing – In such a short time, [the main character, Greg] accomplished so much! He persevered through setback after setback, taking every opportunity to learn and grow from his experiences. He has inspired and touched so many lives in such deep and lasting ways. He has used the fuel of his outrage, the fuel of his passions, the fuel of his imagination, the fuel of the love and support of those he befriended and inspired, to drive him and support him...Difficult – Many times I was near tears as I read about what Greg has done... I have dreams of projects to do with my students...Yet, when it comes to getting down to the details of doing this, I seem to crash... I think I am afraid. I imagine that my fear is of failure…in fact, my primary failure is in not doing...I am [now] going to start really showing up. I am sure that I will fall flat on my face many times in this process. But I will just show up again. Inspiring – ...Reading this book is helping me to recognize how deeply I resonate with the ideas of bringing people together – building bridges. ..I have a poem taped to the door of my apartment so that I see it as I leave each day...The poem is called “The Bridge Builder” by Will Allen Dromgoole and it speaks of a man who comes to a “chasm, vast and deep and wide” crosses it himself and then builds a bridge over the chasm. When others ask him why he is building, since he already made it across, he responds “There followeth after me today/A youth whose feet must pass this way./Good friend, I am building the bridge for him.” Greg is a bridge builder. And by his example, he has inspired youth and aged alike to go out and build bridges. I am working to find my path in this bridge building. His story is yet more encouragement to follow the deep yearnings of my heart. I thank you for sharing his story, it is shaping so many other stories, including mine." NANCY FISH, HEAD OF SCHOOL, WALNUT PARK MONTESSORI SCHOOL (MA): "The Milkshake Man was engaging and inspiring. The lesson of kindness was right in line with our core values... Our children could relate to the main character and demonstrated through follow-up work in the classroom all the ways they could make a positive difference in others' lives. It was wonderful to see them express their hopes for changing the world in a positive way." NATALIE, HIGH SCHOOL STUDENT (CALIFORNIA): "The First Thirty should be read by any college bound student or anyone with hopes in making a difference. Student's everywhere can easily relate to Greg Siegman's story and sense of humor..."
NATALIE B, MINISTRY OF TRAINING, COLLEGES AND UNIVERSITIES, GOVERNMENT OF ONTARIO, CANADA: "I absolutely loved the book and appreciated the thirty lessons, reading each lesson intently as well as consciously absorbing and applying the wisdom... The First Thirty is an inspiring story with a strong message that resonates across race, gender, age and geography....Most importantly, Greg’s story teaches you to never give up and to embrace each perceived obstacle as an opportunity rather than a challenge. I have been inspired to do more and to reach out to inspire change and make a difference." NATE, 5th GRADE STUDENT (IOWA): "The Milkshake Man, I love the title!! The illustrations were amazing and the story line is funny but serious at the same time." NATHAN, MIDDLE SCHOOL STUDENT (IL): "The First Thirty is a good and funny book. Many of the students like the part where Greg had to wear a helmet because he was so distracted by your dreams. There is a lot of things you can learn from this book. The book is not just a reading novel - you can learn a lot from it. It can help you in life, also." NICOLE, MEMBER, WOMEN'S SOCCER TEAM at ST. JOHN'S UNIVERSITY: "...an inspiring story about creating your own path in life no matter what others expect of you. This book helped give me the confidence to live my own dreams rather than live out other people's dreams of what they wanted me to become. This is a must read for all who aspire to forge their own path in the world, make a difference, and truly live the life that they have imagined for themselves." NICK HEGEMAN, 1ST GRADE TEACHER, WISCONSIN: "The Milkshake Man is a great example of kindness and thinking of others. It shows young readers how one person can help to make a difference and inspire others." OBE IHEME, THE SALVATION ARMY (SUMMER CAMP COUNSELOR): "I thought The Milkshake Man had a beautiful message... great for the kids to hear and also the adults. The story was amazing..."
OLGA PARRAMORE, FIRST GRADE TEACHER, TEXAS: "I really enjoyed The Milkshake Man. I think the milkshakes appealed to the kids, and the underlying message was great. In this day and time, it's nice to know there are still people that do good in this world. They need to know that change can start small, and with any small act of kindness." PARKER, STUDENT, CENTRAL COLLEGE: "[The main character] had many different influences during his life... No one had a more profound impact than his grandmother... she loved her grandson greatly and constantly challenged him to reach his potential. Many of her proverbial pieces of wisdom are sprinkled throughout the book and all demand attention and a small moment of self-reflection." PAT HOGAN, MINNEAPOLIS-ST. PAUL INTERNATIONAL AIRPORT: "I really loved reading The First Thirty. We all set goals as we travel through life. If we open ourselves to possibilities, then the people we encounter and the lessons we learn along the way are often the best of the trip." PAT LANG, PRESIDENT, CONFEDERATION COLLEGE (CANADA): "I read The First Thirty. I was truly inspired...it made me think about the privilege I have every day to change someone's life. I challenged myself to see if there is something more I could be or should be doing. Greg is...truly a gift to society..."
PATRICK BRANDT, OFFICE OF SCIENCE, TRAINING & DIVERSITY, TIBBS, UNIVERSITY OF NORTH CAROLINA: "Greg's story [in The Silhouette Man] reminds me of Harriet Tubman... both dedicated their life to helping individuals one by one, largely behind the scenes. They did the same seemingly ‘simple’ things over and over, but those actions, taken both individually and in aggregate, have had far reaching effects…He is living proof of Dr. King's words - "Almost always, the creative dedicated minority has made the world better." PATTI GROTE, DIRECTOR/LIBRARIAN, MASON CO. M. BEVEN ECKERT MEMORIAL LIBRARY: "As a librarian in a small town, I see how important it is for all of us to help each other 'belong' in the community and help meet the needs of the community. The First Thirty is an uplifting reminder that no matter what our age and talents, we can find a way to volunteer and serve." PAUL, PRINCIPAL, CONNECTICUT: "I personally read The First Thirty earlier this year and was brought to tears on three different occasions. I knew right away that I wanted to try and make it possible for our students and staff to meet Greg. The themes of his story reinforce aspects of our mission like service, leadership and lifelong learning." PAUL STEWART, PRESIDENT, UNDERGROUND RAILROAD HISTORY PROJECT OF THE CAPITAL REGION, INC (NEW YORK): "I finished the book and enjoyed it...Greg's road was filled with mountains and valleys, triumphs and disappointments...many young people will benefit from his struggle...I found the impact of Harriet Tubman and Martin Luther King on his life a real delight. I loved the work toward reconciliation for young and old, rich and poor, blacks, whites and others..."
PETER K, STUDENT FROM KENYA: "An American tale with global relevance....illustrates the ability within each of us to help bridge the divisions that have separated so many for so long." PRISCILLA, HOTEL EMPLOYEE, ARKANSAS: "I had the awesome opportunity to read The First Thirty. My colleague left his copy at work and I am soooo happy he did. Wow, I mean I could not put it down. Very well written and page after page I could not wait to see what the main character did next! I love to fight/stand up for the underdogs as well and I love it even more when they shine so bright!...Thank you so much for sharing this story." REBECCA MULLEN, MSEd, READING SPECIALIST AND EXECUTIVE DIRECTOR OF PROGRAMS FOR READING POWER, INC. - "In The First Thirty, Greg Forbes Siegman captures the defining moments of reflection in all our lives with passion, humbleness, and insight. Each reader has a chance to cozy up and have a milkshake with Greg through his thoughtful stories, memories, and life changes. This beautiful book is great for readers of all ages to see beyond their own worlds while connecting with many types of people across the globe." REE KAPLAN, PHILANTHROPIST, OKLAHOMA: "Just finished The First Thirty last night. Now will start The Silhouette Man. Enjoyed the book so much. All I can say is WOW, wow, wow!!!... The Grandma (character) was amazing!!... I hope I always make a difference in someone else’s life just by recognizing them and saying hello. Thank you to Greg for continuing to carry the torch of believing in the good will of others." ROSEMARY, WISCONSIN: "I just finished [The Silhouette Man] last night. WOW!! It was excellent!!! I enjoyed reading the story, plus it was well written and easy to read, hard to put down...[The main character] is a true...connector, make it happen person. Very mission driven, passionate, don't take no for an answer...all of those things that make a successful fundraiser. My goodness, nothing stopped him. I'm impressed and motivated. He was so young to be doing all that he did, plus I feel we are never too old to accomplish great things, also." RUSSELL, STUDENT, MOREHOUSE COLLEGE: "A poignant story that epitomizes the evolution of never-ending struggles into ever-lasting legacies." S. WILLIAMS, UNIVERSITY OF WISCONSIN: "...I thought it was a great read. The overall theme I took away from the book really reminded me of one of my favorite poems, The Man Who Thinks He Can. I can almost recite it from memory..."If you think you're beaten, you are. If you think you dare not, you don't. If you'd like to win, but think you can't. It's almost a cinch you won't...Life's battles don't always go to the stronger or faster man, But sooner or later the man who wins is the man who thinks he can!" SAM C, PARENT, ILLINOIS: "Thanks so much for coming to our town's library and sharing The Milkshake Man with our community! I loved that the book had so many strong themes and fits right into the acts of kindness that are huge in schools right now." SAM G, PARENT & COMPANY PRESIDENT, (CALIFORNIA): "The Silhouette Man illustrates the responsibilities we have as parents, grandparents, teachers and business leaders to influence the people around us...."
SAMANTHA F, SEATTLE: "I just finished reading The First Thirty...a thoroughly enjoyable story, exposing the funny quirks behind a genius." SANDRA YESNOWITZ, PTA CULTURAL ACTIVITIES CHAIR, BEVERLY FARMS ELEMENTARY SCHOOL (MD): "I am so pleased with the way the readings & classroom activities went. The students really loved Greg & I think they got the message of doing something for your community, I find it fascinating he was able to make a picture book from all the information in The First Thirty. I think he did a great job at that & I think The Milkshake Man will be a big success with kids. Our students obviously loved it..."
SCOTT M, PARENT, MARYLAND: "A Place To Sit addresses important topics in a way 12-year-olds can easily grasp." SHARON G, CRYSTAL COVE (FLORIDA): "After more than 2 decades working in retirement communities, I think it is safe to say I am hooked on this business, hooked on this population, and hooked on searching out any philosophies that may relate to the position I am blessed to hold. Some books have become invaluable to me because their messages are dear beyond words; and I am inspired anew each time I reread them. The Silhouette Man is in this category. This is a touching tale of dreams coming true, of the magic of a Grandma’s support and love, and a reminder that the world goes on because of interactions between generations which create constancy. I would recommend this book to anyone who has grandparents or who doesn’t, who has dreams or just wishes they did, and who is trying to define their place in the world and refuses to let others define it for them. When I began reading this book for the first time, I so wanted to hug that little boy and just let him know that different is okay. In fact, if you have the stamina to remain different, the chance of you doing something extraordinary is even greater.... I pray I will be the kind of grandma Greg had!" SONYA H, HONOURS BACHELOR OF ARTS (UNIVERSITY OF TORONTO) - CANADA): "I really liked the book,..it was inspiring. I think it's good for both children and adults, the lessons in it resonate with people of all ages and I found them to also really have an impact on me." SPRINGFIELD REPUBLICAN: "The First Thirty has captured the attention of critics and readers nationwide." STEVEN E, FATHER AND BUSINESSMAN, NEW YORK: " A great story about defining what success really is; a must read for anybody, especially teenagers and young adults coming of age and trying to come to grips with what really matters...The simple lessons will stay with you a lifetime." SUE, EDUCATOR, IOWA: "...a very enjoyable read that I will pass on to my friends and fellow teachers. What a great inspiration for young people and adults alike!" SUSAN KATZ, EXECUTIVE DIRECTOR, JEWISH FEDERATION OF PEORIA: "The Silhouette Man was inspiring and energizing and reminded me of the importance of having passion in my work. Greg is truly an inspiration to all of us who want to make the world a better place." TEACHER INFORMATION NETWORK: "A dazzling gem. When you finish, you will want your students to read it, too. Its lessons are immensely teachable." TERRY GROSSBERG, FOUNDER OF HP FORWARD: "I loved The First Thirty. I loved it for its simplicity of message, its "never get down" attitude, but most of all, I loved it for all the kids who don't fit in. My life's mission has been to bring people together and when I read this book, it gave me tons of ideas for how to do so. Congratulations to Greg for his lifelong passion, and for creating a work which speaks to folks of all ages." TERRY LEE, YOUNG PROFESSIONAL, CALIFORNIA: "...Before reading The Silhouette Man, someone may expect a cookie-cutter story of how one man's good deeds changed the world for the better. It is not so. Although The Silhouette Man briefly highlights positive events which resulted from Greg Forbes Siegman's efforts, the majority of the story--the heart of the story--tells of the difficult journey...Personal struggles, family differences and the loneliness which one experiences from feeling at times they just do not "fit in" are all shared in a manner that is both straightforward and sincere. Siegman does not gloss over the hard times, but rather illuminates them in a way which helps the reader appreciate the sweetness of the good ones even more..."
All those cited above are generally cited by their affiliation with schools, teams, organizations &/or companies to which they belonged at the time they provided the review. (For instance, if someone is listed as attending / working at a particular school, that means they attended / worked at that school at the time they provided the book feedback. They may or may not still be there now). In case the cover of The First Thirty (with the man looking out the window) does not look familiar, the 10th anniversary edition has a new cover (and some tweaks to the content). This (featuring the boy in the football helmet) was the original edition's cover.